Arch. Farmacol. Toxicol. 8, 7-11. Rev. Esp. Fisiol. 40, 53-62. J. Neurosc. Meth. 16, 289-300. Ed. by Atwater, Rojas and Soria. Plenum Publ Co, Bethesda; USA. 139-157. Biochem. Biophys. Res. Com. 144, 965-972. Eur. J. Pharm. 165, 223-230. Electrically-evoked catecholamine release from cats adrenals. Role of cholinergic receptors. Membrane-mediated effects of the steroid 17--estradiol on adrenal catecholamine release. J. Pharmacol. Exp. Ther. 259, 259-285. The effects of botulinum toxin type D on the triggered and constitutive exocytosis/endocytosis cycles in cultures of bovine adrenomedullary cells. Inhibitory and contractile effects of okadaic acid on rat uterine muscle. Eur. J. Pharmacol. 219, 473-476. Ionic mechanisms involved in the secretory effects of histamine in the rat adrenal medulla. Eur. J. Pharmacol. 241, 189-194. Histamine H1 receptor activation mediates the preferential release of adrenaline in the rat adrenal gland. Localized L-type calcium channels control exocytosis in cat chromaffin cells. Multiple calcium channels subtypes are present in rat chromaffin cells. Intracellular calcium and secretion from individual adrenal chromaffin cells. A comparison between the rat and bovine. Otilonium, a potent blocker of neuronal nAChR. Brit. J. Pharmacol. 117, 463-470. Blocking effect of otilonium on calcium-channels and secretion in rat chromaffin cells. Eur. J. Pharmacol. 298, 199-206. Temporally resolved, independent stages of individual exocytotic secretion events. Exocytotic release from individual granules exhibits similar properties al mast cells and chromaffin cells. Resolución temporal del fenómeno exocitótico en la célula cromafín. Hipótesis quimiosmótica. Eds. Univ. Las Palmas de Gran Canaria; Spain. 167-174. Interaction between G protein-operated receptors eliciting secretion in rat adrenals: A possible role of protein kinase C.
The rat adrenal gland in the study of the control of catecholamine secretion. Semin. Cell. Dev. Biol. 8, 113-120. Effects of external osmotic pressure on vesicular secretion from bovine medullary cells. J. Biol. Chem. 272, 8325-8331. Trends Pharm. Sci. 19, (Inserted poster). Calcium channel subtypes and exocytosis in chromaffin cells: a different view from the intact rat adrenal. Naunyn Schmiedeberg Arc. Pharmacol. 360, 33-37. A new way for the analysis of exocytosis. In: Medical informatics Europe ’99. Eds. P. Kokol et al. IOS Press. 400-405. Nitric oxide modulates a late step of exocytosis. J. Biol. Chem. 275, 20274-20279. Warning! perfusion syringes may not be inert. Eur. J. Clin. Invest. 30, 653. Functional role of chromogranins and intragranular matrix in the last phase of exocytosis. In. Chromogranins. Functional and clinical aspects. K.B. Helle & D. Aunis Editors. Advances in Experimental Medicine and Biology, 482, 67-82. Kluwer Academic/Plenum Publishers, New York – London, ISBN. 0-306-46446-2. Automatic analysis for amperometrical recordings of exocytosis. J. Neurosci. Meth. 103, 151-156. Morphological and functional characterization of beige mouse adrenomedullary secretory vesicles. Cell Tiss. Res. 304, 159-164.
cAMP modulates the exocytotic kinetics and increases the quantal size in chromaffin cells. Chromaffin cell: from basic to clinical research in the new millennium. Trends Pharm. Sci. 23, 53-55. Nongenomic regulation of the kinetics of exocytosis by estrogens. J. Pharmacol. Exp. Ther. 301, 631-637. Pharmacological regulation of the late steps of exocytosis. Ann. NY Acad. Sci. 971, 184-192. A novel non-genomic action of estrogens: the regulation of exocytotic kinetics. Ann. NY Acad. Sci. 971, 284-286. New approaches for analysis of amperometrical recordings. Ann. NY Acad. Sci. 971, 647-654. Hydralazine reduces the quantal size of secretory events by displacement of catecholamines from adrenomedullary chromaffin secretory vesicles. La exocitosis como mecanismo de comunicación neuronal. Una visión desde la célula cromafín. New roles of myosin II during vesicle transport and fusion in chromaffin cells. J. Biol. Chem. 279, 27450-27457. Curr. Med. Chem. 4, 187-193. Cell Biology of the Chromaffin Cell. A Simple Way to Build a Grinder for Carbon Fibre Electrodes for Amperometry or Voltammetry. Intragranular pH Rapidly Modulates Exocytosis in Adrenal Chromaffin Cells. ARDILES, A.O. ; MARIPILLAN, J.; LAGOS, V.L. ; TORO, R.; MORA, I.G. ; VILLARROEL, L.; ALES, E.; BORGES, R. and CARDENAS, A.M. (2006). Calcium signalling and exocytosis in chromaffin cells. Chronic hypoxia up-regulates 1H T-type channels and low-threshold catecholamine secretion in rat chromaffin cells. J. Physiol (London) 584, 149-165. Good practices in single cell amperometry. Methods Mol. Biol. 440, 297-313. 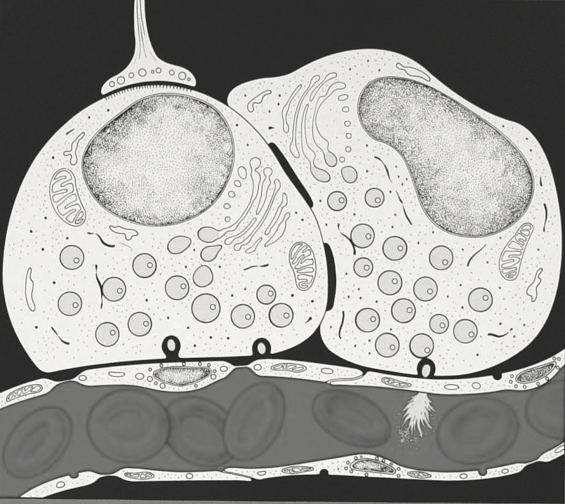 Physiology of the Chromaffin Cell. Measuring secretion in chromaffin cells using electrophysiological and electrochemical methods. Histogenesis and morphofunctional characteristics of chromaffin cells. The crucial role of chromogranins in storage and exocytosis revealed using chromaffin cells from chromogranin a null mouse. Intravesicular calcium release mediates the motion and exocytosis of secretory organelles: A study with adrenal chromaffin cells. J. Biol. Chem. 283, 22383-22389. On the role of intravesicular calcium in the motion and exocytosis of secretory organelles. Commun. & Integrat. Biol. 2, 71-73. Chromogranin B gene ablation reduces the catecholamine cargo and decelerates exocytosis in chromaffin secretory vesicles. Br. J. Pharmacol. 159, 1548-1556 . Cell Mol Neurobiol. 30, 1181-1187. Cell Mol Neurobiol. 30, 1159-1164. Ouabain enhances exocytosis through the regulation of calcium handling by the endoplasmic reticulum of chromaffin cells. Methods Mol Biol. 846, 223-234. Chromogranins A and B are key proteins in amine accumulation but the catecholamine secretory pathway is conserved without them. Vesicular Ca2+ mediates granule motion and exocytosis. Functional roles of chromogranins in the exocytotic process. J. Mol Neurosci. 48, 317–322. An inhibitor of neuronal exocytosis (DD04107) displays long-lasting in vivo activity against chronic inflammatory and neuropathic pain. J. Pharmacol Exp. Ther. 341, 634-45. The ATP or the Natural History of neurotransmission. On the role of chromogranins in the secretory pathway. Br. Med. J. 348, g1806. Chalcones as positive allosteric modulators of 7 nicotinic acetylcholine receptors: A new target for a privileged structure. Eur. J. Med. Chem. 86, 724-739. The interaction between chromogranin A and catecholamines governs exocytosis. Behav. Brain Res. 278, 98-106. Measuring the contractile response of isolated tissue using an image sensor.